What Do Anxious Teens Need? Challenges? Interests? Get in touch! It’s no secret that school districts face continual financial pressures. But among the many roadblocks to securing increased funding is the challenge of candidly communicating such a need with voters. A new study sheds light on just how complicated this can be. In a new paper, education policy expert Martin West and advanced doctoral student Beth Schueler, both of Harvard Graduate School of Education, reveal that Americans tend to vastly underestimate the average salary of a public school teacher in their state. They also underestimate the amount their local school district spends per pupil. And when provided with the actual numbers on salaries and spending, the researchers say, Americans experience “sticker shock” — and become much less likely to support an increase in government funding for public schools. Using data from a 2012 Education Next survey of 2,993 respondents who are nationally representative, West and Schueler found that the more someone unknowingly underestimated public school budgets, the more likely she was to support an increase in funding. In the study, respondents were first asked to guess the average amount of money spent per child in their school district and the average salary of a public school teacher in their state. They were then asked if they thought those numbers should increase, decrease, or stay about the same. Some respondents were given the actual spending and salary amounts for their district and state before responding to that second question. The average respondent estimated that their local school district spent $6,189 on each student and that a teacher in their state earned $36,063 annually. In actuality, those numbers were, on average, $12,628 and $55,042, respectively. When not informed of the actual numbers, 62.5 percent of respondents supported raising per-pupil spending, and 63.7 percent supported raising teacher salaries. But when they were given the real numbers, only 42.9 percent of respondents supported raising per-pupil spending, and only 36.7 percent supported an increase in teacher salaries. The researchers also found that respondents were more likely to support an increase in public school funding as an abstract idea than they were to support an increase in public school funding through taxes, specifically. Previous studies have found widespread support across the United States for increased funding of public education. Does this new paper indicate that Americans only feel that way because they are misinformed? Not necessarily. Schueler and West note that the study’s methods “may not have accurately simulated the way that information is acquired and applied in the real world.” Respondents may have pulled back support only because they had just learned that spending was much higher than they had assumed. In a less rushed or formal scenario, the same people might still take into consideration other knowledge they have on, for example, the state of their local school building or the materials inside. 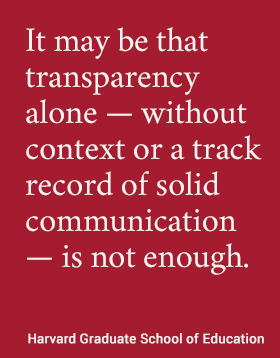 It may be that transparency alone — without context or a track record of solid communication — is not enough. To diversify school reading material, fund a fieldtrip, hire an extra reading specialist, or give veteran teachers a raise, states and districts will have to think creatively, giving constituents an inside look at why these measures are necessary for their children’s and their neighbors’ futures. Our free monthly newsletter sends you tips, tools, and ideas from research and practice leaders at the Harvard Graduate School of Education. Sign up now. In early education, a new study asks the big questions: what works, for whom, and under what conditions?